November 28 is Giving Tuesday, a global day of giving that kicks off the charitable season. Help others by supporting the following retailers that all pledge a commitment to giving back. Every Pura Vida bracelet is handcrafted by artisans in Costa Rica and supports the creative community there. In an effort to share the Pura Vida philosophy with others, Pura Vida Bracelets has partnered with more than 190 charities worldwide to support important causes. By purchasing a unique bracelet from the charity collection, you can support a cause near and dear to your heart, like The Foundation for Women’s Cancer, Mental Health America, and The National Coalition Against Domestic Violence. These bracelets make great stocking stuffers for women of all ages. For every pair of Warby Parker glasses sold, a pair is distributed to someone in need. Warby Parker has distributed more than 3 million pairs of glasses through its “Buy a Pair, Give a Pair program.” We love the Haley Eyeglasses for their wide fit and modern take on the cat-eye; perfect for someone with a prescription or just for fashion purposes. The Welty Eyeglasses are ideal for someone who is no-frills about their glasses, but still wants to make a statement. For the person who has it all, the classic Aubrey jet-black sunglasses are sure to wow. TOMS transforms everyday purchases into a force for good around the world. With every product you buy, TOMS helps a person in need. The Vista Boots are perfect for the person who loves to stay comfy but needs a functional pair of boots to get them through the winter. For the sharp-dressed man in your life, the Porter Boots check off all his boxes. The Navy Light Burst Tiny Toms Classics are sure to sparkle on the kiddo who wears them this season. Ivory Ella was founded on the principle of living a life devoted to saving animals, helping others, and doing everything you can to support your community. Ten percent of the brand’s profits are donated to charitable organizations that benefit both humans and animals alike. The Snowflake Tee simultaneously keeps the busy student on your list comfy while supporting Save The Elephants. Jewelry fanatics love the fashion and social statement this ALEX AND ANI Rosemale Gold Charm Bangle makes in an effort to support Boston Children’s Hospital. Join the fight to cure breast cancer with the Breast Cancer Research’s Neon Pink Ribbon Tee, a great stocking stuffer for women of all ages. With each pair sold, Bombas Socks donates a new pair to those in need. They have donated more than 5 million pairs to 650 homeless shelters throughout the United States. For the perfect stocking stuffer that comes packed into a beautiful gift box (no wrapping needed), Bombas Socks has options for the whole family. Shop the limited edition Holiday Sock 4-Pair Gift Boxes for kids, women, and men. Little Lotus donates a portion of proceeds from each product sold to ensure a pre-term baby in the developing world receives access to their infant incubator. Little Lotus has impacted more than 200,000 babies in 22 countries. Their Swaddles keeps preemies and newborns as safe and cozy as can be. For kiddos ages 3-24 months, the Sleeping Bag helps them sleep better and longer with NASA fabric that keeps them at the perfect temperature. Love With Food is the easiest way to snack smart and do good. For every box sent, a meal is donated to feed hungry children in America. 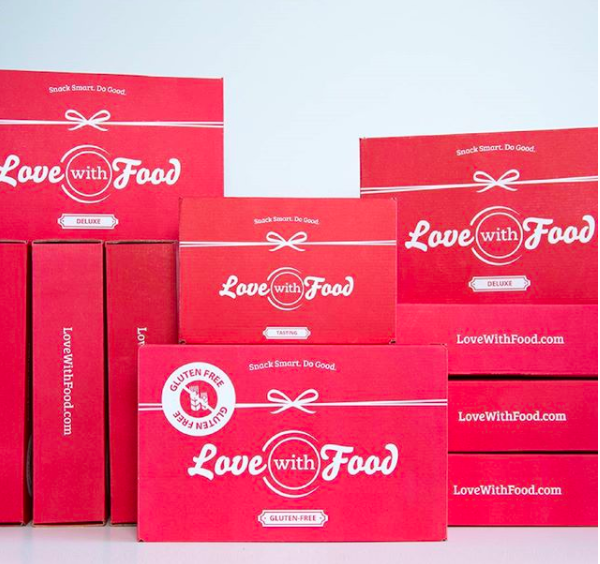 To date, Love With Food has donated almost 700,000 meals. 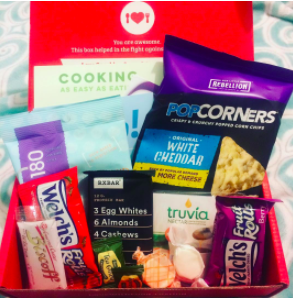 The Tasting Box includes 7+ snacks, a good option for the friend who doesn’t plan to share. The Deluxe Box packs in 15+ snacks, perfect for friends and family to enjoy with the gift recipient. 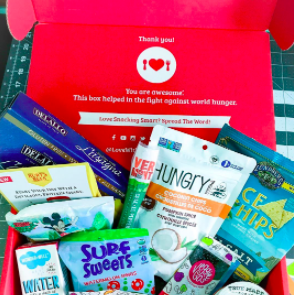 There’s even a Gluten Free Box with 10+ snacks to introduce someone with the allergy to new and different snacking options. All snacks included are different every month and are either organic or all natural. 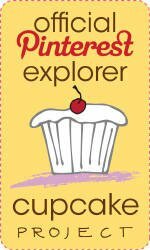 They include no trans fats, hydrogenated oils, high fructose corn syrup, or artificial colors or flavors. My Cousin April has been using Young Living for years and while I listened to her tell me about them I never really considered using them myself until last year, when I got a cold with a cough that just wouldn't go away. It was bad, so bad that I could barely get a sentence out without having to stop and cough and try and catch my breath. Not good considering I spend more than half my time at work on the phone with people. Not good either that I'm one of the 33 million American's without health insurance. I tried everything over the counter that I could and when it wasn't enough I asked my cousin what I needed to do. Theives oil she told me, it will help. She's got five boys, if anyone knows about how to get rid of one and to keep germs out of the house it's this girl. She and her kids rarely, if ever, get sick. So I mixed a few drops into some unscented body lotion and rubbed it into my feet and onto my chest. I did this every night for about three days and I finally started to feel better from this cough that literally plagued me for weeks. I started diffusing it in my office after that to keep the germs at bay since we work with high school students and there's always someone coming in with some kind of cold and if I can keep the air clean in my office it's honestly better for everyone. And then spring came and I didn't think much about the oils. Until I started having stomach issues from everything I was eating. I found out I was lactose intolerant and everything I loved to eat was making me absolutely miserable, even coffee. I switched out to coconut milk and finally settled on almond milk for my coffee and morning smoothie but I still wasn't 100% after that, until I realized there was lactose in the mix I use... but I wasn't really happy with any of the alternatives so I just dealt with the constant audible gurgling and popping that was going on in my stomach all day long on a daily basis and taking a lactose pill or two every morning with my smoothie and whenever I felt I was eating something that was going to give me grief of some sort and taking more pills for gas pains multiple times a day. 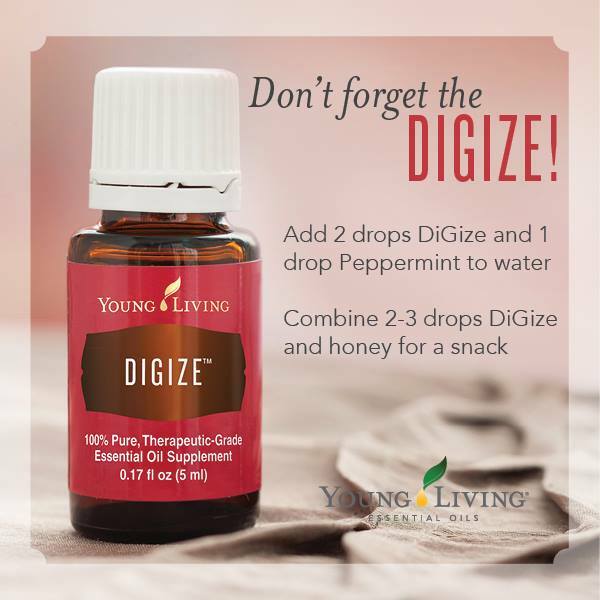 Try DiGize she told me, it tastes awful, but take two drops with a carrier oil in a gelatin capsule... I didn't have any the day I got my DiGize, so I put two drops in a small glass of water and downed it in one shot. Oh God it was awful.. but, I didn't have any rumblings in my stomach all day. Not one audible gurgle or pop, I wasn't bloated or uncomfortable.. I was just ... fine. All day. For the first time in months. That night I stopped and got myself some gelatin capsules at the Vitamin Shoppe on my way home from the office though because I'm no dummy, lol. The next morning I put three drops of DiGize in a gelatin capsule and filled the rest with coconut oil, put the cap on and downed it with the first sip of my morning smoothie and expected to feel something weird. I felt nothing but comfortable... normal even. I went about my morning and I was fine, I had my coffee, ate my lunch and afternoon snack, had dinner and I was still fine. That right there made me a believer. I was spending a ton of money on pills for lactose intolerance that were barely working and still taking more pills for the gas pains and it was exhausting. I was stressed every time I ate anything I didn't make myself. One capsule of an essential oil and a carrier and it kept me free of any issues all day, and has kept me from issues ever since. Now, don’t get me wrong, I still have to stay away from dairy, this hasn’t cured my lactose intolerance, not by a long shot. Milk and cheese still make me miserable. But by taking three drops of this oil in a capsule with coconut oil has helped me tremendously from the daily gas and bloating I was suffering from. It took me months of misery to finally become a believer and finally take some sound advice from someone I really trusted who really knew what she was talking about. 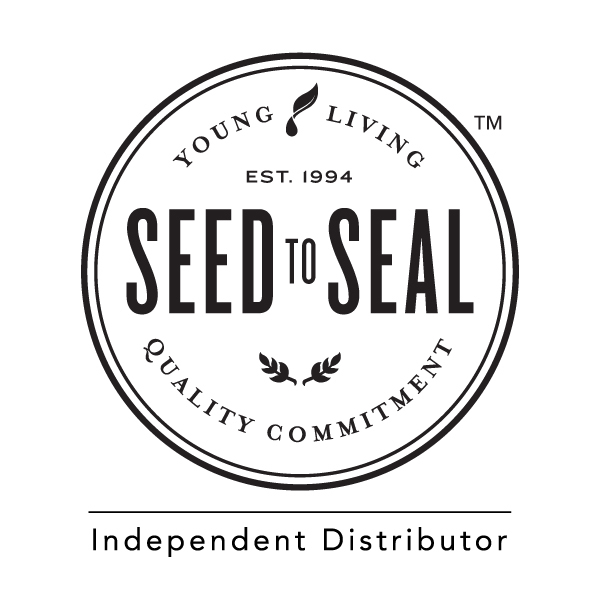 If you're interested in learning more about what Young Living is all about click here. As I mentioned in my last post I've been working on a better me. Working on being healthier and cooking healthier not just for myself but my family. I had a request for French onion soup for dinner for a Sunday night and I went about searching for a recipe that wasn't so full of fat and calories and in the end wound up tweaking a recipe to make it healthier (because honestly, there's no need for 2 Tbs oil and 2 Tbs unsalted butter). Time and Patience, yes.. all that extra fat, no way. I have this pan I love, like, I absolutely Adore it and use it for just about anything I can. It's only a 2Qt, but I love that nothing sticks to it, and if I do get some sticking a little soak in hot water and scrub a bit with baking soda and it's good as new. I've had this for over a year and a half and It still looks good as new inside. 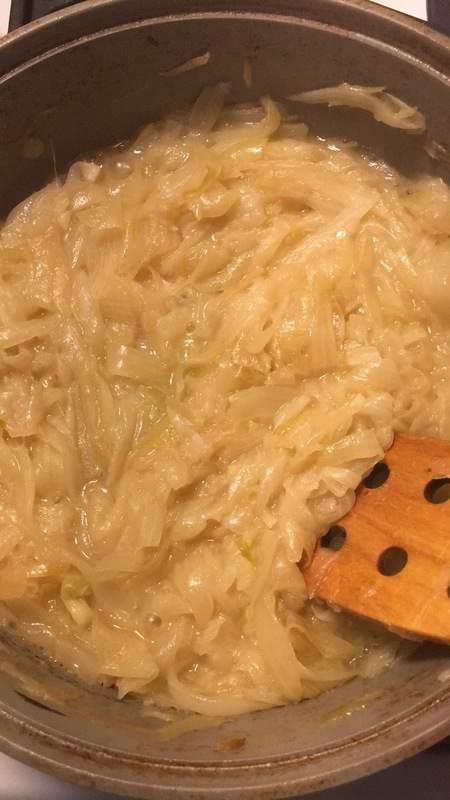 I was making my soup in the crock pot, but to get the onions properly caramelized was either going to take me 12 hours in the crock pot, or just about an hour on the stove top. I don't like leaving the crock on overnight (especially with four legged critters in the house). The recipe that I based mine off used 3 pounds of yellow onions, plus oil and butter. Since becoming lactose intolerant butter isn't really my friend and all that fat is really unnecessary in this recipe (as well as 12 hours for the onions in the crock pot, that's not happening). I started out with three pounds of yellow onions plus one big vidalia onion, cut into quarter moon slices, one tablespoon of vegetable oil, 1 Tsp Sea Salt and set it over medium-low heat. I knew this was going to take a while, so I had a project I was working on while this was going. This was the most time consuming part of this whole recipe, but really, it's so worth it because the end result is absolutely delicious. I started this at 9am on a Sunday morning, my son was sleeping, my BF was at work so I had the time and while I was doing this I was working on a needlepoint project so I only got up every so often to give it a stir, plus this is a nice heavy bottomed pan that doesn't burn as long as you've got he heat set nice and low. I don't have soup crocks, so in the end I ended up toasting the bread and cheese in the oven and topping the bowls of soup with it like that, it was amazing either way. So now, without fail, here is my recipe, adapted from the Kitchn's recipe. Cut the onions into quarter moon slices and place in a heavy bottomed pan with 1 Tbs oil and 1 tsp Kosher salt. Sweat the onions over low heat and continue to cook over low heat, stirring occasionally until caramelized. Mine took just about an hour and a half to be right where I wanted them. Add to Crock pot along with the broth and vinegar. Cover and continue cooking on low for 6 to 8 hours. Longer cooking will only intensify the flavors and add richness to the soup. Taste and season with more salt and pepper if needed. Portion the soup into oven-safe bowls. 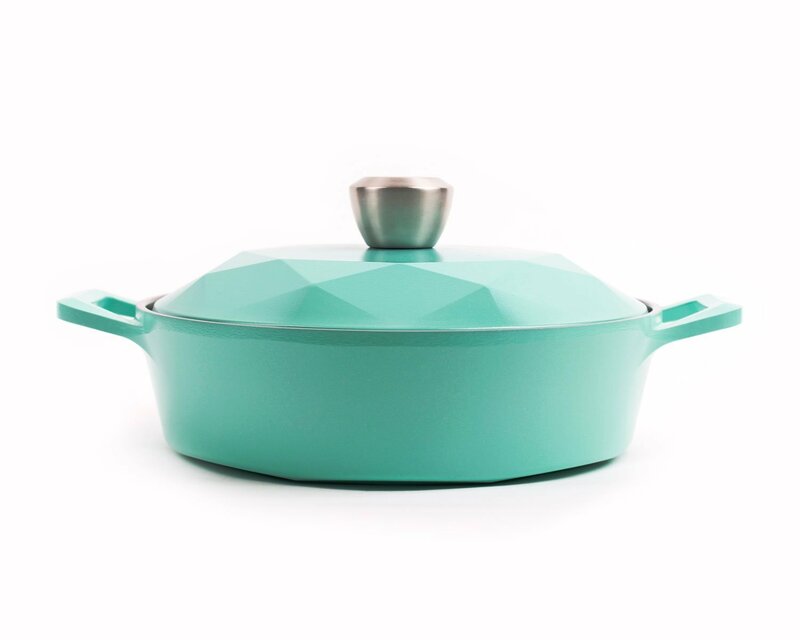 Arrange a rack in the upper third of the oven and heat to 350°f and place the bowls on a rimmed baking sheet. Top each bowl with a slice of toast and about 1/3 cup of shredded cheese. Bake until the cheese is completely melted, 20 to 30 minutes and then broil for 2 to 3 minutes. Turn the oven to broil. Broil until the cheese is bubbling and browned, 2 to 3 minutes. Remove from the oven and let cool for a few minutes. Serve with chopped fresh shallot or onion if desired. No, I have not disappeared, I haven't fallen ill or anything like that. I've just been... So. Damn. Busy! I know, I know you're probably going "Really Ashley, it's been over a year since you've posted Anything at all!" While that may be true that nothing has been posted here, the Facebook page stays fairly active when I have a minute to post something there. It's not any help right now that Blogger hasn't updated it's App so it'll work with my iPhone or iPad either. I still cook, pretty much every night, although I've had to change some things around since becoming lactose intolerant recently. (Seriously it's like I'm being punished for something, I had a klondike bar a few weeks ago and thought I was going to need a visit to the ER the stomach cramps were so bad). It all started when my morning smoothie started not really agreeing with me so I cut down the milk and I was still getting "the gurgles" so I just cut it out completely replacing it with water (yuck) and finally turning to coconut milk and then finally unsweetened almond milk as a suitable replacement. Not having milk in my coffee was not an easy change for me, but since I'm officially addicted to Stök coffee (Black, unsweetened, OMG it's the best coffee) I've been okay with just a little Soy or almond creamer and no sugar. I started to cut sugar out of my diet in March when I decided I was almost 40 and it was time to change the way I ate for good. It started with cutting out sour candy (I was addicted, I'm talking a bag a day, and not the little bags you find in the checkout either, the bigger bags you find hanging in the candy aisle O.o). I started using MyFitnessPal and logging everything I ate, and it wasn't easy in the beginning but I lost 8# in the first few months just by managing what I ate and trying to squeeze in walking workouts on the weekends (I absolutely love Leslie Sansone walking workouts as well as Tracy Campoli and Jessica Smith workouts on youtube). I feel better, I fit into my clothes better and I look better. Moving forward the blog will feature recipes that my family loves and that I’ve worked to make healthier for everyone.